Under a project "Securing Water for Food" (SWFF) waste water is being recycled for irrigating exotic vegetables cultivation by our partner RDO Trust in the Nilgiris. Nilgiris grows lots of exotic vegetables and is a huge employment source for the local communities especially women. Cultivation of these items need water at regular intervals and is majorly dependent on monsoon. 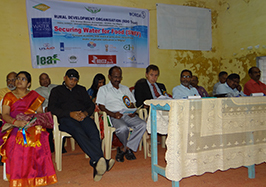 With an aim to sustain cultivation reuse of grey and black water after proper treatment is being piloted by Rural Development Organization (RDO). RDO has joined hands with international experts from WASTE, Netherlands. WASTE is an international NGO with more than 30 years of experience in waste management and sanitation. RDO will select 2000 women farmers for participating in this project and enable round the year availability of water while solving waste water issue also.